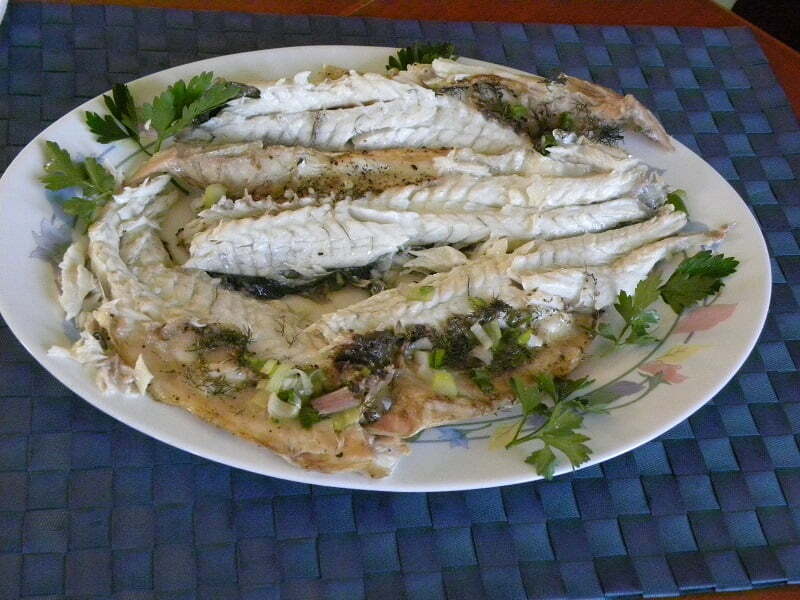 Lavraki (Dicentrarchus labrax or seabass) is one of the fish we love and I cook very often and this is a very easy way to prepare it. I am sorry I haven’t been around lately as I’ve had this flu the past few days which kept me in bed. Today I am feeling a bit better but still I will make a quick post and head back to bed again. I prepared this dish a couple of weeks ago and this is a very healthy dish and is so easy to make. Ask your fish monger to scale the fish for you and all you have to do is fill its tummy with your favourite herbs, season it with salt, pepper and oregano and and cook it. Adding potatoes is optional, but my children love roasted potatos. Cut them into thin wedges and season them with salt, pepper and oregano. I reserved some of the garlic and fresh oregano I used for the fish and added it to the potatoes as well. I then added some lemon juice, olive oil and water and wrapped them in parchment paper. I do this as this way I use very little olive oil, which makes them roasted but without all the unnecessary calories. I then put them in the baking tray which I covered with aluminum foil and cooked them in the oven for 1 hour. While the potatoes were baking, I prepared the wild greens and the pesto. When the potatoes were ready I added the fish of top. A fish which is about 500 grams in weight needs about fifteen minutes to cook. The pesto turned out delicious and matched perfectly with the fish, the potatoes and Stamnaggathi. We also grilled some bread and spread some pesto on it and it was perfect. We couldn’t stop eating it so there was none left for next day. Salt, pepper, oregano (dried, and fresh and a little garlic) juice of ½ lemon and a few tablespoons olive oil and a few tablespoons of water. Olive oil and lemon juice to serve. Add the other ingredients in the belly of the fish and refrigerate until ready to use. Put the potatoes in a bowl and add all the ingredients and mix. Wrap them in parchment paper and then put them in a baking tray and cover it with an aluminium tent. Bake them for an hour and remove the tent. Cook for fifteen minutes and turn the potatoes over. Add the fish on top and cook for 20 more minutes. Stamnaggathi (Wild greens salad): See how to cook them here. Bake them for an hour and remove the tent. Cook uncovered for fifteen minutes and turn the potatoes over. I am sending this recipe to Cinzia, of Cindystar, who is hosting this week’s Weekend Herb Blogging, created by Kalyn and now managed by Haalo. Hola Ivy! Oh, I didn’t know you were sick!!! How awful 🙁 When the weather changes it’s so easy to catch the flu. I hope you recover soon. Take care darling! I love the fish cooked this way 😀 it keeps all its flavours and if you add all these herbs… Mmmmmm, then it’s delicious. Ivy, get well soon. Have more water, Vc. fruit…..and rest. That meal looks really flavorful and scrumptious! I hope ur feeling better now Ivy…that dish sounds so interesting, looks delicious. girlichef’s last blog post..Food so good it may send you "over the edge." Dear Ivy, I hope you’ll get well soon. This whole combination of foods sounds heavenly. I must try to make pesto with oregano. I actually have a nice bush of Italian oregano in my herb garden, so I have a fresh supply of it. Hope you get better soon Ivy! What a lovely, healthy dish! The use of the herbs and pesto really makes the fish flavourful! Hope your doing better now. Oh wow herby and yum roasted potatoes….. Thank you everybody for your wishes. I am really feeling much better today. Wow I love that pesto. I’ve never made pesto with pecans but I think it’s a great idea! Glad to hear you’re feeling a bit better. Perastika Ivy…hope you’re well now that the weather has warmed up. Lavraki is one of favourite fish and it’s just right with a ladolemono. Glad you’re feeling better, Ivy. This is a fish even I can enjoy. Love the idea of the oregano pesto! Sorry to hear that you had the flu! I am glad you are feeling better though! This meal looks scrumptious! I love the oregano pesto – I am going to have to make that! Hope you’re feeling better soon! This meal sounds so delicious. The fish and potatoes and oregano pesto all sound perfect together! This would definitely warm you up and is good food to hopefully lead to a speedy recovery. I can just the wonderful flavour of the pesto, it looks absolutely delicious. I am sure my brother would much prefer eating that on his breakfast this morning! Ivy, I love fish simply cooked but full of herb fragrance and oregano is one of the best for sure. Thanks for participating, hope you well recovered by now. I hope u r feeling better Ivy. We eat a lot of fish & this sounds lovely. Love the use of pecans with oregano.